Yenque lectures at academic institutions from coast to coast, and has served on the faculty at California State University San Marcos, where he lectures in English and Spanish on topics such as acting, adapting narrative to film, Latino theatre, and performance techniques for future teachers. Along with Dr. Darci Strother (CSUSM), Yenque co-created and co-directed an intense study abroad program in Spain conducted in 2009. 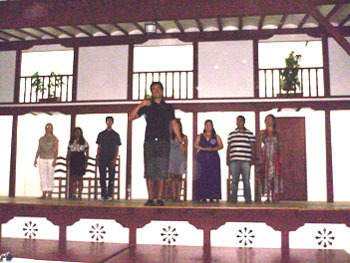 This innovative collaborative program provided a group of mainly first-generation-college-students with the chance to study Spanish drama and acting in the unique context of an international classical theatre festival. Yenque’s success with students parallels his success on the screen and stage, and he is committed to weaving together his considerable skills and talents as both an actor and as an educator. Yenque has also dedicated his time and talent to a number of social causes that are important to him. In 2008, he co-produced and narrated “Never Too Early, Never Too Late,” (with versions in both Spanish and English). This gang prevention video has been distributed to families and law enforcement organizations nationwide, and was directed by Professor Kristine Diekman through a cooperative effort with the City of Oceanside Police Department. In 2009, Yenque helped celebrate young people’s commitment to fighting the global climate crisis, by appearing as a celebrity host of the National Wildlife’s “Campus Chillout,” along with Al Gore and Michael Welch (Twilight). 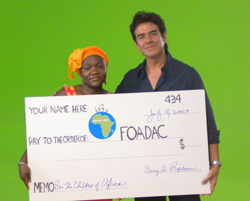 Also in 2009, he joined actors Shirley Jones and Efren Ramirez, donating his time to the Foundation of Orphaned Disabled African Children (FODAC), in a campaign to bring awareness to the plight of the orphans and to increase fundraising. Yenque also assisted the Puerto Rican Traveling Theatre in a campaign to keep the lights shining on this important cultural and artistic organization.